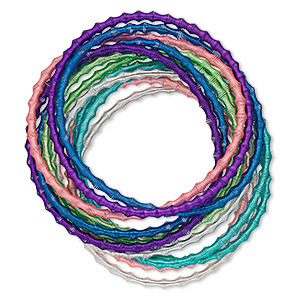 Bracelet, stretch, steel, assorted colors, 3-4mm wide twisted ribbed coil, 7 inches. Sold per pkg of 12. Item Number: H20-2905JE Have a question about this item? 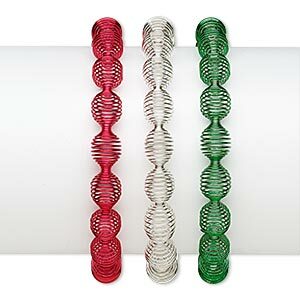 For instant just-for-fun style slip on coil stretch bracelets! 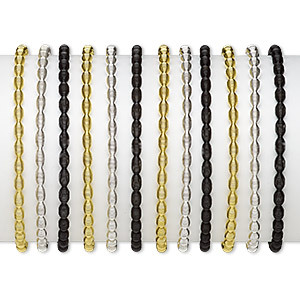 Wear the lightweight steel bracelets in multiples, mixing the hot colors for vibrant summer fashions. 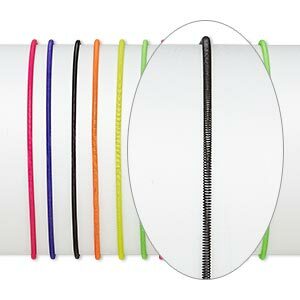 Economical package includes twelve bracelets in a ribbed design. Colors can include green, silver, pink, light blue, dark blue and purple. Colors, shapes and sizes may vary in each lot. 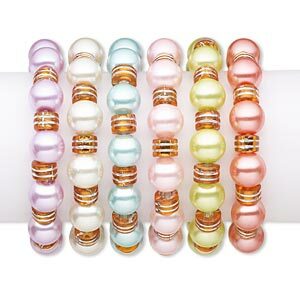 Bracelet, stretch, glass pearl and acrylic, assorted colors, round and rondelle, 7 inches. Sold per pkg of 6. Bracelet, stretch, steel / gold-finished steel / silver-plated steel, black, 4mm wide with oval design, 7 inches. Sold per pkg of 12. Bracelet, stretch, steel and silver-plated steel, red and green, 10mm wide with rondelle design, 6-1/2 inches. Sold per pkg of 3. 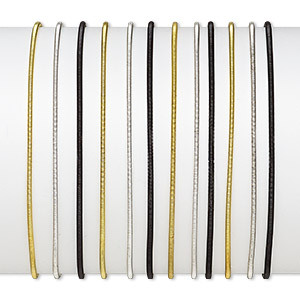 Bracelet, stretch, steel / gold- / silver-finished steel, black, 2mm wide, 7-1/2 inches. Sold per pkg of 12. Bracelet, stretch, steel, assorted colors, 4mm wide with oval design, 7 inches. Sold per pkg of 12. 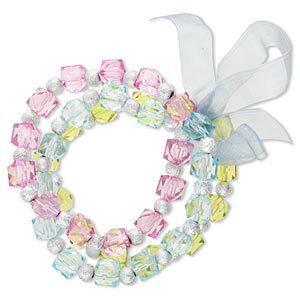 Bracelet, stretch, acrylic / organza ribbon / silver-coated acrylic, blue / pink / green, 9mm wide, 6-1/2 inches. Sold per pkg of 3. Bracelet, stretch, steel, assorted colors, 2mm wide, 7 inches. Sold per pkg of 12. 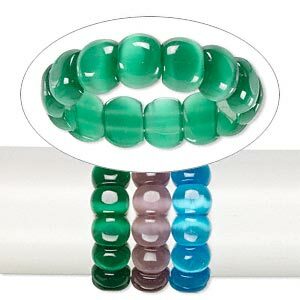 Bracelet, stretch, cat's eye glass, dark green / turquoise blue / light purple, 17x13mm flat oval, 6 inches. Sold per pkg of 3. 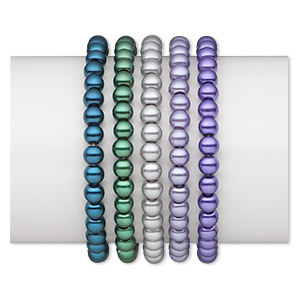 Bracelet, stretch, glass pearl, assorted colors, 6mm round, 6 inches. Sold per pkg of 5. 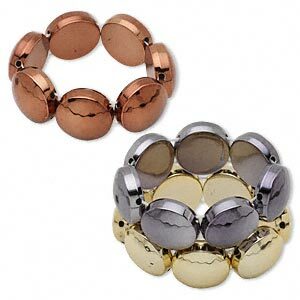 Bracelet, stretch, acrylic, copper / gold / gunmetal, 28x12mm flat round, 7-1/2 inches. Sold per pkg of 3.